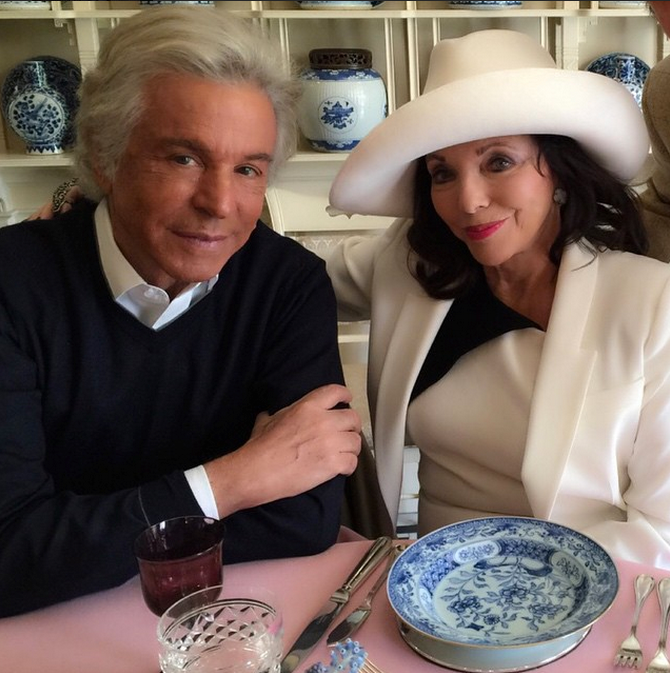 Eagle-eyed follows of Giancarlo Giammetti on Instagram caught sight of a very familiar face last month, as Mr. Giammetti posted a shot of himself dining with none other than Dame Joan Collins. “Saturday is for friends!” noted the caption. And indeed, Collins is a friend of the true-blue variety. The iconic Dynasty star, now reappearing on the small screen on the series The Royals, has come out to support Mr. Valentino and Mr. Giammetti at myriad events over the years. She was there in 1988, for example, when Maison Valentino staged a special fashion show at the 20thCentury Fox Studios in L.A.; nigh on a quarter of a century later, Collins was there again, in London, at the opening of the Valentino: Master of Couture exhibition at Somerset House in London. That’s to cite but two examples. And Mr. Giammetti and Mr. Valentino have repaid the favor, by, say, toasting her at the launch of her book Passion for Life in Mayfair in 2013. She’s also a regular guest on the Valentino yacht, the T.M. Blue. 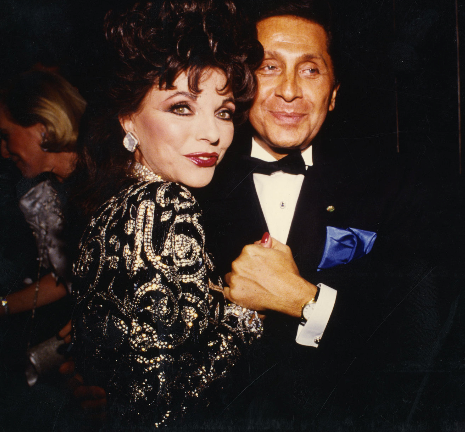 Perhaps nothing sums up Dame Joan’s regard for Valentino, though, than this fact: When the queen of TV melodrama was called upon to play an ambitious fashion editor in the 1986 miniseries Sins, who did she call upon, in turn, to design her character’s outfits? Valentino, of course. Perhaps, last month, she and Mr. Giammetti reminisced about that over lunch.